We were on the Metro one afternoon, and I was talking with a Greek woman who had spent some time in the UK, a German, and a Spaniard. It was so interesting to be in a casual, everyday place and be able to speak about life with people from so many different points of view. We stayed in apartments owned by the American College of Greece. They were similar to IUPUI’s Riverwalk Apartments with key cards for security. I was one of 8 women in my unit. What courses did you take abroad and what did you do for your program? I took a three credit hour course called Business in Society where we learned about Corporate Social Responsibility (CSR). In addition to our course work including a group project and presentation, we went on about five company visits that warmly welcomed us. Do you have any money advice to students who wish to study abroad? First, start saving now and apply to any and all scholarships that you can. It doesn’t matter if you have a study abroad program in mind or not; it’s never too early to save. Second, in the program’s information, it usually lists out a general budget. Expect these to be low prices and plan for higher prices to be safe (you never know if you will have an emergency when you are overseas). Also, keep in mind that you will not be working during your time abroad, so make sure you have enough funds for when you get back. I noticed a lot of my classmates spent too much money during the first half of the trip, and that they were running low during the second half of the trip. I personally set and stuck to a discretionary spending budget for myself, which I kept in mind every time I withdrew Euros from an ATM during my trip. We were kept pretty busy, so we didn’t have much free time. However, when there was extra time that didn’t need to be spent doing homework, then we would usually run down to the nearby square to eat or shop and sometimes, we went to the Mediterranean Sea to swim! What was it like interacting with the locals? They were all so kind and welcoming. I did pick up a few Greek words from speaking with them, too! They were used to tourists, so they easily explained cultural differences whenever we were confused. We spent one holiday in a tavern with the professor’s family (the professor was a native), where we enjoyed delicious traditional food and even circle danced with them. They knew that we were from the United States, so they played “Y.M.C.A.” by the Village People for us, too. Did the trip reaffirm your career goals? Did it change them? What skills did you learn on this trip that will help you? The number one skill that this experience developed for me was how to interact with people from a variety of backgrounds. A major responsibility in my future career is to build relationships with all kinds of people, so this will hopefully give me a leg up at work. 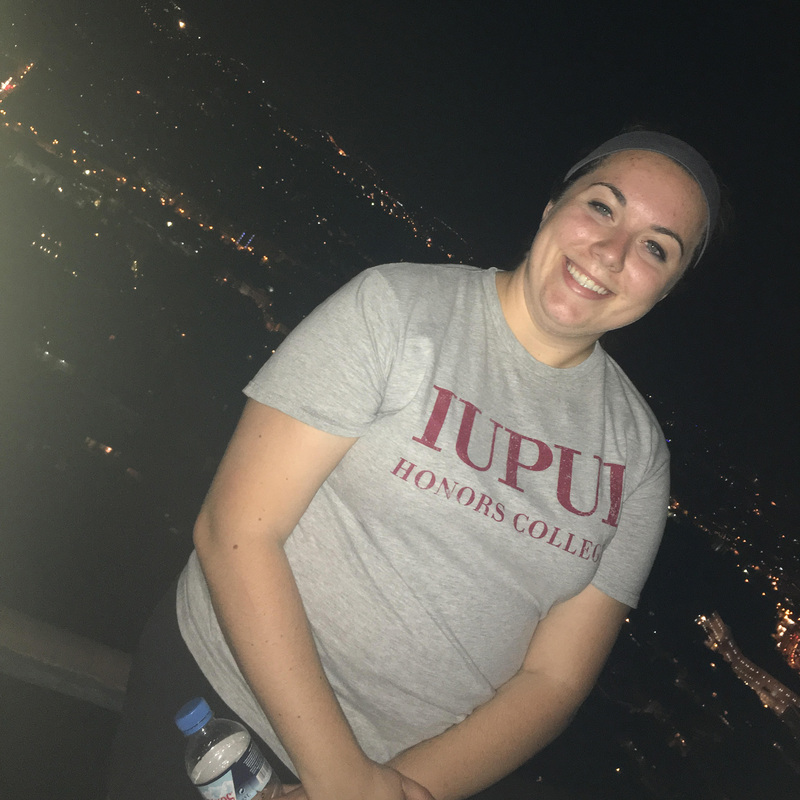 What would you tell an IUPUI student looking to study abroad? Any other advice? Don’t worry about not knowing anyone on your trip! Most students don’t know each other at first, but you’ll easily bond together as you experience culture shock together. This is another way to make more friends while you are in college (even if they don’t actually go to your campus). Also, get e-textbooks, so you don’t have to take up space in your suitcase with books. If possible, try to spend a holiday celebration with some locals; you’ll learn so much about their culture on a holiday! 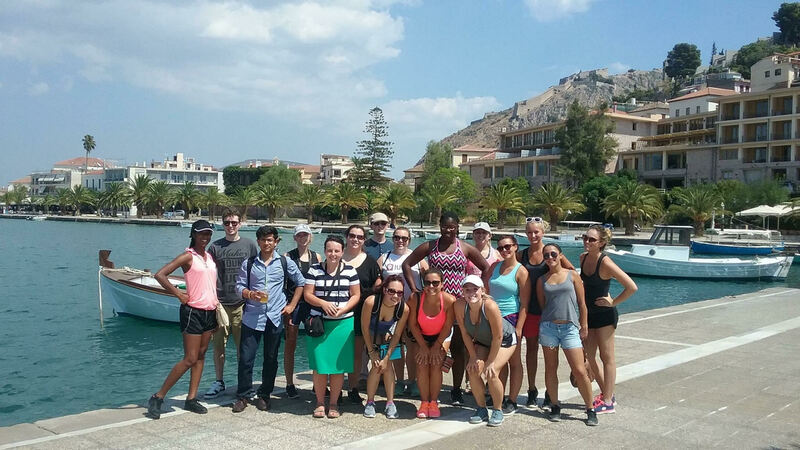 This is my class visiting Nafplion, Greece. On the weekends, we went on day trips to other parts of the country, and Nafplion was exactly what I imagined Greece and the Mediterranean Sea would be like! Nafplion was so beautiful and is my favorite place that we visited!